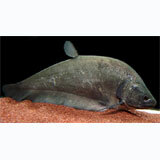 Asian Black Knife Fish does well if kept singly; they tend to not get along very well with their own kind. You can keep them with large catfish because they will not bother one another. Asian Black Knife Fish have bigger mouths than you might realize so be careful not to keep fish that are small enough to fit in their mouth. These very aggressive predators are also nocturnal. The Asian Black Knife Fish is a carnivore that can be fed a variety of meaty foods such as worms, crustaceans and insects. They can be trained to accept a variety of store bought foods that contain other much needed nutrients. The male Asian Black Knife Fish stands guard over the eggs and the young. The eggs take approximately 1 week to hatch and the fry can be fed newly hatched brine shrimp. When young, these fish are comfortable in groups, but as they mature, they much prefer to live singly. Adult specimens will often not tolerate another Clown Knife or similar species in their tank. They also cannot be kept with smaller fish of any kind, as anything small enough to fit in their mouth will be considered as food and they will often take a snap at larger fish, just on the off chance they may get a meal out of it. Clown Knifes tolerate large tankmates quite well, often ignoring attempts by territorial cichlids to chase them off. This can sometimes lead to problems with injuries being inflicted, although the clown will usually retreat to its hiding place before any major conflict occurs.